Home / #Halloween.Ukraine / #HalloweenTrueNews :Chechen soldier who plotted to kill Vladimir Putin was wounded in Kiev. 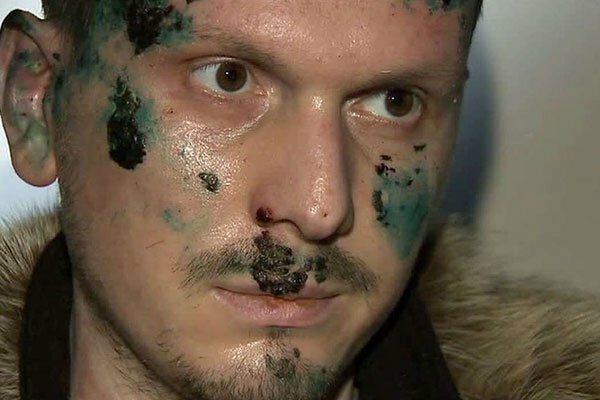 #HalloweenTrueNews :Chechen soldier who plotted to kill Vladimir Putin was wounded in Kiev. Putin assassination plot suspect wounded, wife killed in Ukraine. Adam Osmayev in 2012 in Syria. A Chechen volunteer soldier who was accused of plotting to kill Russian President Vladimir Putin was wounded and his wife killed when their car was strafed by gunfire near Kiev. Osmayev was accused by Moscow authorities of plotting to kill Putin just weeks before the Russian leader's election to a third term in 2012. Osmayev had already survived an assassination attempt in Kiev on June 1. Monday's attack occurred less than a week after Ukraine opened a terror probe into a bombing that wounded a nationalist Ukrainian lawmaker in Kiev. The apparent assassination was the latest involving high-profile figures in Ukraine who bitterly opposed Russia. It also threatened to further damage relations between two neighbours which already treat each other as direct foes. Ukrainian interior ministry adviser Anton Gerashchenko said Amina Okuyeva died and her husband Adam Osmayev was injured when their car was hit by a hail of bullets while crossing a railroad track. "Adam Osmayev was wounded, but he will live," Gerashchenko wrote on Facebook. "I just spoke to him by phone." Interior ministry spokesman Yaroslav Trakalo confirmed Okuyeva's death to the Interfax-Ukraine news agency. He later added that investigators planned to open a "premeditated murder" inquiry but not a terror probe. He was held for two and a half years in a Ukrainian prison but never extradited to Russia. A second suspect in that case was sentenced in 2013 to 10 years in prison after being handed over to the Russian authorities. Osmayev had already survived an assassination attempt in Kiev on June 1. The assailant was shot dead by Okuyeva on that occasion. The June bid to kill Osmayev was staged by a man who initially presented himself as a journalist with a French newspaper. The Ukrainian interior ministry later identified the assailant as a Russian citizen. The locally renowned husband-and-wife team fought as volunteers alongside Ukrainian forces battling Russian-backed insurgents in the east of the war-scarred state. Radical Party member Igor Mosiychuk was walking out of a television studio after giving an interview Wednesday when an explosive device went off near a scooter parked on the street. Mosiychuk's bodyguard died on the way to hospital and a passer-by was killed at the scene. Both Mosiychuk and Ukrainian prosecutors said they suspected the Russian security services of being behind the attack. That blast was the latest in a string of politically charged bombings to have hit the Ukrainian capital since last year. Former Russian opposition lawmaker Denis Voronenkov was gunned down in broad daylight in the Ukrainian capital after in March. A car bomb killed journalist Pavlo Sheremet in July 2016. The independent Ukrainska Pravda news site's reporter had denounced the political courses taken by both Russia and Ukraine. And a colonel with the Ukrainian defence ministry's intelligence service was killed when his car exploded in Kiev in June. All three cases remain unsolved and Russia has rejected all charges of involvement.